It is good that people have reacted with such outrage to the blasphemy which is the re-enactment of the Satanic black mass by the Harvard Extension School Cultural Studies Club planned for Monday in a building on campus. And it is good that the response has included people from around the country and even the world committing to holy hours and Masses of reparation and demands for Harvard to stop this affront to Catholics. In Cambridge itself, the Harvard Catholic Student Association and the MIT Catholic student association have committed to a joint Eucharistic procession and Holy Hour at St. Paul’s Church in Harvard Square at the same time as the black mass. However, this whole event is an important wake-up call to us. For one thing, black masses are not a relic of the past dredged up by the group. There are Satanists who regularly steal Hosts to desecrate in their foul rituals but don’t advertise their ceremonies openly. And even on a less diabiolical level, how many acts of desecration occur in our parishes regularly? I don’t mean just unworthy reception of the Eucharist by people who don’t know better, but such acts as receiving while chewing gum, taking the Host from your mouth and either discarding it or playing with it, and the like. We can’t organize protests and muster outrage at every one of these acts of desecration, but what we can do is make Adoration and Benediction of the Blessed Sacrament a regular part of our lives, including prayers and acts of reparation for indignities suffered by the Lord under the form of the Eucharist. We too should examine our consciences and confess any sins on our part from unworthy reception of the Eucharist or times when we’ve treated our Eucharistic Lord with less than the dignity He deserves. 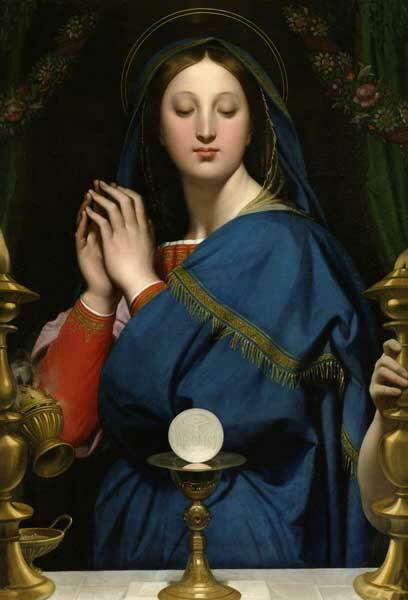 Let’s turn this awful blasphemy into an occasion for a renewal of our love and respect for the Blessed Sacrament. What better way to stick it to Old Scratch, right? Post Script: Evidently, the Enemy really didn’t want me to write this blog post. In the 15 minutes it took to write this, my computer shut down six, 10 times. Excellent perspective Dom. As for your computer shutting down 10 times…..I would NOT suggest trying to bless it with holy water, since that would probably shut it down permanently. 🙂 God bless you in your work. Today our deacon at St Francis of Assisi in Castle Rock CO. chased a man who put the Eucharist in his pocket. They scuffled in the parking lot the heathen got away. Today is the day of the black mass in OK City. I shudder to think what this heathen will do with the body of Christ.